Olive oil come from the fruit called Olive (Olea europaea), which belongs to the family of a traditional tree in the Mediterranean Basin region. Apart from the cooking, it is also used in Cosmetics, soaps, lotions, medicines. The health and skin benefits of the olive oil are in-numerous. Let’s discuss some of amazing benefits of olive oil. Olive oil has monounsaturated fat called oleic acid, which considered as a healthy dietary fat which gives many beneficial effects to your health, and is a healthy choice for cooking. Regular consumption of olive oil lowers the risk of cardiovascular diseases like high blood pressure or hypertension, high blood Cholesterol or hyperlipidemia. Thus, reducing the risk of stroke. olive oil is the only source of monounsaturated fat associated with a reduced risk of stroke and heart disease. The antioxidants in olive oil make you more resistant and keep you away from the infections. It also protects body's immune system. Consumption of olive oil lowers blood pressure, protects LDL particles from oxidation. The presence of a chemical, oleuropein along with carotenoids and antioxidants such as vitamin E offer anti-inflammatory, antithrombotic, antihypertensive as well as vasodilator effects. Mono unsaturated fats in Olive oil are the main reason the people around Mediterranean remain slim even after a huge consumption of oily foods. Excess intake of fried foods normally increases the risk of a heart problem. In case of olive oil, the Mono unsaturated fats of the extra Virgin Olive oil take care of the heart health. Apart from frying, the olive oil is also eaten with bread, salads and more. Oleic acid is believed to reduce joint pain and swelling from rheumatoid arthritis. The beneficial effects are greatly increased when combined with fish oil. 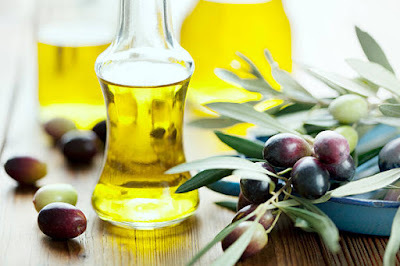 Olive oil loaded with anti-oxidant and anti-inflammatory properties which prevents Asthma. Olive oil is loaded with anti-ageing properties. The natural signs of aging like lines, wrinkles, sagging skin, open pores are lesser in the people who intake olive oil regularly. Olive oil is also used in making of various anti-ageing skin products. Antioxidants in Olive oil, like Vitamins A and E helps in repair and renew skin that has been damaged from suntan, environmental pollution, other modern hazards mainly cigarette smoke and junk food. These antioxidants have the natural ability to stimulate cells and return skin to a firmer, smoother, and healthier state. Olive oil can be used for soothing rough and irritated skin, it nourishes the skin, thus you appear younger with a brighter complexion. Olive oil rich in polyphenols with anti-bacterial and anti-fungal properties, that works on itchy scalp, dandruff, frizzy hair, split ends and promotes healthier and more manageable hair. The Olive oil hair treatment (massaging) increase the blood circulation in your scalp, improves hair's elasticity and prevents breakage. You can use it as the natural hair conditioner.